I didn’t expect this to have 6 voices. Gives me a bit of a Volca MD vibe, and I’m all for more new Volcas having swing. Only let down for me is that, unlike the Volca Sample (first Volca with swing! ), it appears to have mono output, as I see no pan parameter. The stereo 1/8" out might be dual mono like the Beats/Bass/Keys. I could be wrong. But usually Korg’s digital Volcas have a stereo output. I’m hoping for some under the hood and/or even factory pre-panned voices capability. (they sound panned in this video. Either way, great add on for an Elektron with a MIDI sequencer. Excellent way to add 6 drums to your sampler or synth, especially. MM/DN/OT/DT can find joy in this, where Nord has seemed to more or less, abandoned the Nord Drum module, in somewhat typical Clavia style. _EDIT , nevermind! @Jimmo has informed me of the pan. Well then, all systems go, sign me up! I’m currently watching through Cuckoo’s tutorial and he shows you to pan. It’s kind of hidden away but it’s there. Between this and the Volca Modular, it’s good to see Korg not afraid to “level up” the Volca range! Beat me to it, no pun! 69 parameter motion recording across two layers with 6 drum channels. And they separated out patterns, kit and motion. This looks great on paper. Need to listen when I get into work. Has anybody laid eyes on the MIDI implementation chart? All the probability junkies just lost their minds. Yeah, it’s a microtonic / MD-lite (very lite) vibe. Can’t see the kick drum carrying a track but for interesting/unexpected percussion layers I can see it being fun and very usable. After reading through this thread, seeing what features stuck out to the community, I have to say, my interest level went from 0 to “some”. I haven’t heard much sound yet, but I’ll check it out later today. 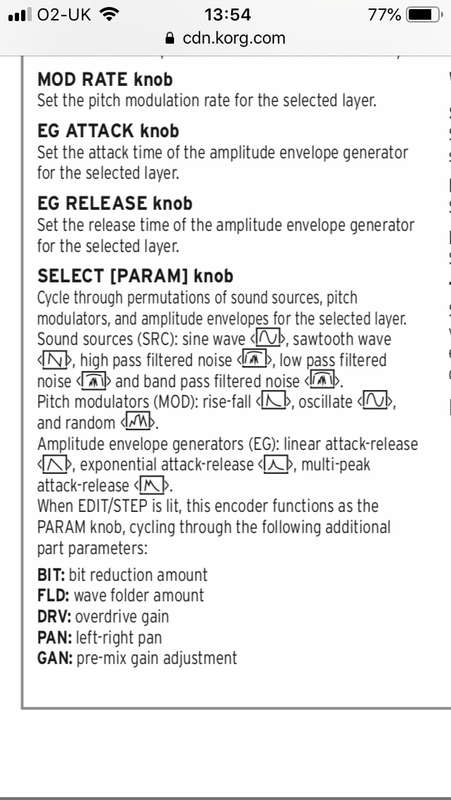 They really packed a lot of features into the volca-sized box. It would be interesting to me as a compact, low-cost, sequenced drum machine used with Digitone, running the audio into the Digitone ins. That would free up a track on the Digitone… Hmmm.